I really miss some features of the 80’s. In those days, we were not worried about politics, nor about political correct censorship (they are the new PMRC, nothing more than that), but only the music. In the USA Metal scene, along with Thrash Metal and earlier screams from Death Metal, there were those bands that were playing US Metal, along the lines of RUTHLESS, OMEN, MANILLA ROAD and many more, there were the Seattle based quintet Q5, that I never heard of until I was asked to write this review for the reissue of “Steel the Light”, their first album released originally in 1984. Time for regret: what a band I was losing, for they are great, indeed! They are into the same trend of many bands of those days, playing a melodic, technical and charming Heavy Metal way that was only found on USA, due the refined melodies and influences from Melodic Rock/Hard Rock from the 70’s (a feature that only bands from those days had) along the modern energy that JUDAS PRIEST and THE RODS brought to the genre back then. Charming, heavy as a ton of pure steel, done with hooking melodies and great choruses, their music is amazing, even today. Although they aren’t playing nothing new, it has a strong and bold personality. 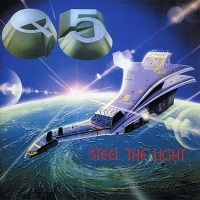 This new version of “Steel the Light” was remastered by Bart Gabriel (AVENGER, CIRITH UNGOL, and others), that gave the songs a new life, but without destroying what was done back on 1984. It’s still heavy and abrasive as on those days, but cleaner and ready for these new days. Be prepared, for they have some lessons to teach you all how to sound on Old School format, but without being outdated. It’s a double CD package. On the first CD, you find the album. The energy shown on “Missing in Action”, “Lonely Lady” (a fine blend between NWOBHM and JUDAS PRIEST influences with the US melodic aesthetics), the hooking rhythm of “Steel the Light” (the bass and drums technique is really amazing, and what energy this song bears), the oppressive melodic hooking grasp of “Pull the Trigger” (these nasty charming guitars are really something lovely), the accessible elements that can be heard on “Ain’t No Way to Treat a Lady”, on the headbanging inciting song called “Rock On”, and on “Teenage Runaway” can be said as their best shots. On the second CD, you’ll find some really excellent and rare material (and some unreleased stuff). So “That’s Alright with You”, “Nothing Ventured - Nothing Gained”, “She’s a Dancer”, “In the Night”, “Waiting for Your Love”, “Our Love Has Come and Gone” and “Your Love is the Best Love” are songs from Demos, Singles, and the last one comes from an unreleased Demo of 1983. “Ain’t No Way to Treat a Lady”, “That’s Alright with You”, and “Steel the Light” are live shots from the past. After hearing this album, I only can say that they hit another fan, and hope you all can hear and take the best of this new release of “Steel the Light”. It’s a pity for me that in Brazil, I can’t buy a copy of the album, because I loved it!